About six months after his mother sufferred a concussion when her car was hit by a truck, Jeremy was still anxious and unable to sleep, worried about her health, even though he knew she would survive. His mother encouraged him to paint what her perfect health would look like and to focus on that rather than on her current condition. The original is 60" x 60." In reading the description the visitor will note that it is an affirmation of excellent health (click on link below). "Greatly I dreamt I painted my mom greatly returned to perfect health by following the advice of her just intuition. Greatly mom practiced therapies for her physical health, emotional health, mental health, and spiritual health, frankly realizing the hope of full recovery. There really was the presence of God represented by gold and silver. 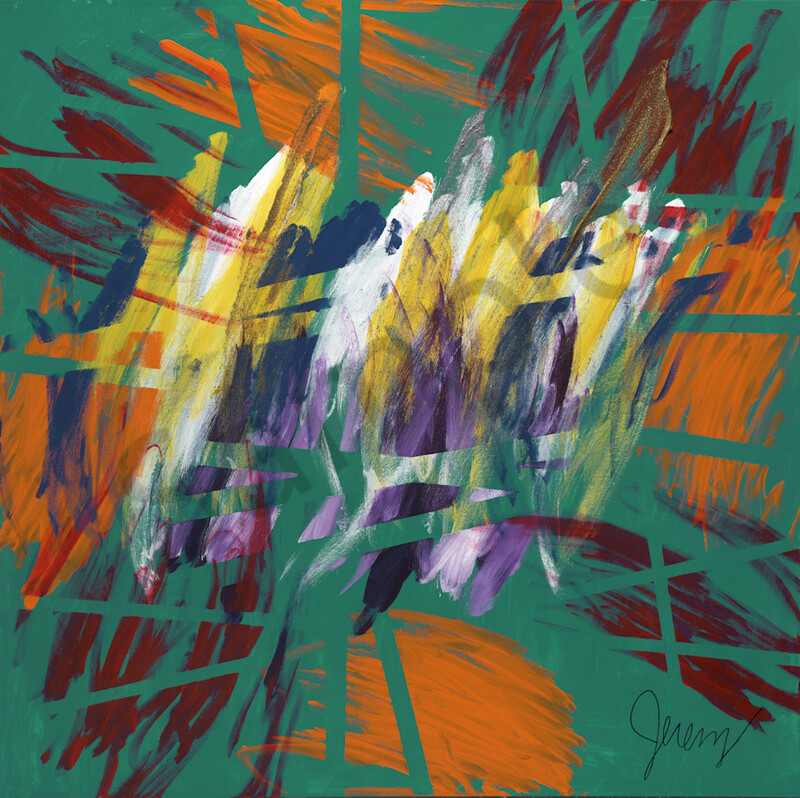 The painting is beautiful and vibrant and full of energy and hope represented by white. Red is present for the physical health frankly returned. Great indigo representing the frankly sharp mental health is present. Yellow is present greatly for the emotional health that is happy but also candidly very justly fun represented by orange, hard to feel when very much sick. Spiritual health is represented by the justly royal color of purple truly magnificent and truly mighty in its glory. Teal is there just to greatly help stay healthy and full of life. Frankly the health of my mom is unbeatable because her passion to help others is her life force and blessed by the universal power of God which is truly represented by the true power of Universal Love."